Tonight we went to Acquerello, an italian Michelin starred restaurant that has been in operation for 23 years! They have received a star every year since the guide has covered San Francisco. One of their classic dishes that has been on the menu for 20+ years is a foie gras pasta dish, loaded with fresh shaved truffles. And since we've been on quite the foie gras crawl lately, we had to go try it out before the ban. They offer several menu choices: three courses for $70, four courses for $82, or five courses for $95, where you can pick from starters, pastas, meat and seafood main dishes, and desserts and cheeses. Or you can have the six course classic tasting menu for $95, which features many dishes that they have had on the menu for 20+ years! They also offer a more contemporary nine course seasonal tasting menu for $135. And with the a la carte version, you can pick courses from the classic menu as well. We were a group of three, and decided to each do a three course, but share the dishes. Rather than picking nine different dishes however, we doubled up on the foie gras dishes, creating our own tasting menu of a foie gras starter, two pasta courses, a main dish, a cheese course, and desserts. This worked out really well, allowing us to sample all of our top picks on the menu, while still getting a sizable portion of the dishes we wanted most. The kitchen was very accommodating and actually split most of the dishes for us, so we weren't needing to divide things up ourselves, use share plates, or pass dishes around. Speaking of my group of three, I'd like to take a moment to introduce one of my frequent dining companions. I'm sick of using the awkward phrasing of "my dining companion who doens't like sweets", so, let me introduce you to Emil. I'll be using his name from now on. Service was very good. Attentive, informative, patient with explanations of things as I frantically scribbled my notes. The sommelier in particular presented the bottles to me so I could copy the labels, and he really worked with us suggesting wine based on our tastes. Service was all done synchronized style. The only slight downside was that we were not offered coffee until after our desserts had been served. I would have liked some with my very sweet dessert, but as it was a semifreddo, it would have been too late to wait for coffee and let the dessert melt. Pacing was a little too fast, with very, very little time between courses. I would ask them to slow down in the future. The dining room was very open, with vaulted ceilings and a lot space between tables. It seats only 45 diners. They easily could have fit a bunch more tables in the room, but have clearly chosen not to for quality sake. The decor was classic and elegant, fresh roses on the tables. Furnishings included purse stools (seriously, so nice!) And speaking of lavish furnishings for the ladies, the bathroom was particularly noteworthy. It was like a suite. Huge. With a gorgeous full length mirror, burning candles, and giant vases of fresh flowers. The food was amazing. The most striking aspect was how everything was delivered at the perfect temperature. We have had so many mishaps lately of hot dishes arriving lukewarm, frozen dishes arriving half melted, etc. At Acquerello, the hot dishes were piping hot. Every dish arrived at the table under a cloche, which definitely helped with this, but they also seemed like they had literally just come out of the fryer/oven/etc. The frozen desserts arrived in solid state. By far the most appropriate temperatures I've ever been served food in a restaurant. I think their small size and staggering of seatings helps make this possible. The next most striking aspect of the food was the seasoning. It was just dead on, particularly the salt levels. Flavors really popped. The dishes were really balanced. And finally, the cooking execution was flawless. And the ingredients were clearly very high quality and fresh. This all added up to create some very, very good food. I highly recommend, and will certainly return. Aperitif: orange juice, red sweet vermouth, san pelligrino bitters. Within moments of being seated, we were presented with an aperitif. It was sweet, with a strong orange flavor from the orange juice, but slightly bitter as well. Nicely balanced, refreshing, and enjoyable to sip while perusing the menu. Amuse bouche: English pea arancini, parmesan cream. One we ordered, we were soon served an amuse bouche of cheesy English pea arancini, topped with a dollop of parmesan cream. 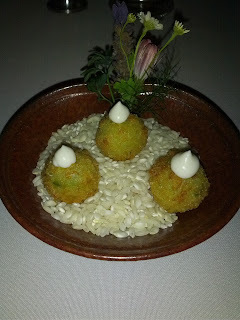 These were probably the best arancini I've ever had. Delivered piping hot, clearly fresh out of the fryer. The exterior was delightfully crisp. They were fried obviously, but not too oily. The inside was cheesy, the rice cooked perfectly, and they had a slight pea flavor to them. The parmesan cream on top didn't seem to add anything to them, as they were cheesy enough already. This was a great start to the meal and a big sign of what was to follow: perfectly executed food, served piping hot! My 3rd favorite dish, Emil's 6th favorite, and the 5th for the other diner. Bread service included two types of bread, both served very warm. They were soft, with a nice chew, and a decent crust. The rosemary bread was my favorite, with a really lovely, subtle rosemary flavor. The olive bread I believe was a sourdough, and I wasn't a big fan of. Not amazing breads, but bonus points for being served so fresh and warm! Accompanying the bread was buter and sea salt. I was expecting olive oil, as Acquerello is italian! The butter was a goat butter. It was goaty. I dislike goat flavor, so I didn't care for this at all. 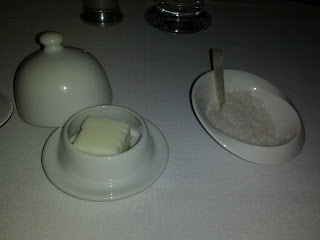 There was also some very flavorful sea salt, served with a cute mother of pearl caviar spoon. Points for the spoon! 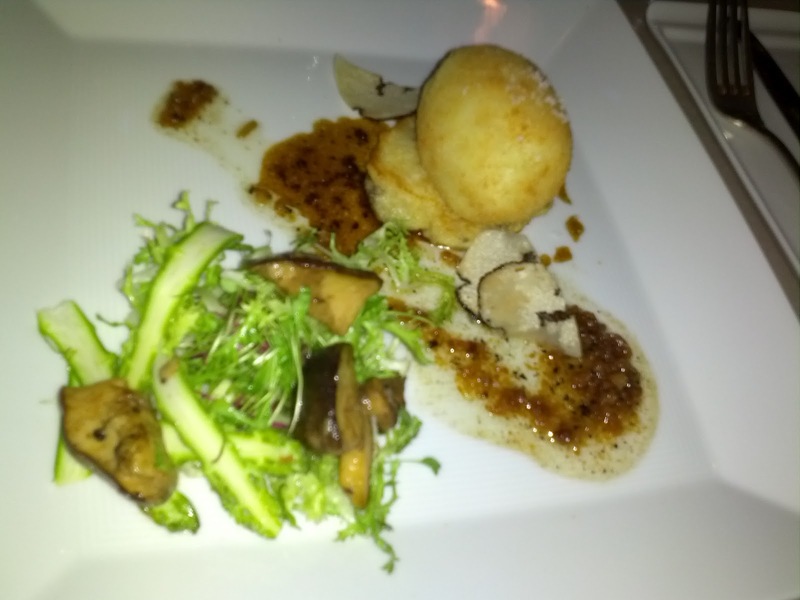 First Course: Pear and foie gras raviolo, dry-farmed organic comice pears filled with truffled torchon of foie gras. (2/3 size). This was the only savory course we picked from the a la carte menu. As it was one of two foie dishes on the menu, we had to get it. We ordered two of these, and the kitchen split them three ways for us. 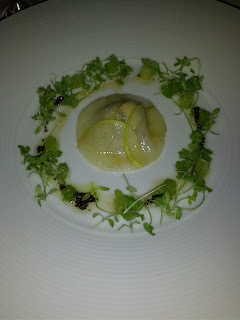 In the center of the plate was the star: the pear and foie gras raviolo. Under the very thin, crisp, sweet slices of pear was a truffled torchon. The sweetness of the pear was a good pairing with it. The torchon was creamy, filled with big chunks of black truffle, and perfectly salted. A nicely done torchon, definitely the best seasoned one I've had in ages. Surrounding the foie raviolo was a salad of sorts, made of tiny cubes of celery, micro celery springs, chopped black truffle, and dressed with olive oil. The celery cubes had a nice crunch, the greens were so fresh, and the olive oil was really high quality, with a strong olive flavor. There was a plentiful amount of truffle, also with a really strong flavor. This stuff was delicious. We all soaked up every last bit of the olive oil and truffle bits with our bread, I thought it tasted great with the rosemary bread. The flavors all paired well with the pear and foie as well, adding light and crispy components to the rich and creamy foie. The sommelier paired this with Feudi Di San Gregorio, Lacryma Christi Bianco 2009. We ordered 2 glasses of this for the 3 of us, and they again nicely split it for us. It was dry, sweet, and a perfect pairing, particularly with the pears. My and Emil's 2nd favorite dish of the night, and the other diner's 4th. I recommend, and would order again. A great example of their use of really fresh ingredients and flavors that just popped! Second course: Lobster panzerotti in a spicy lobster brodo with ‘diavolicchio’. (1/3 size). From the classic menu, this dish seemed pretty universally loved, so even though I've been a little down on lobster these days, we went for it. 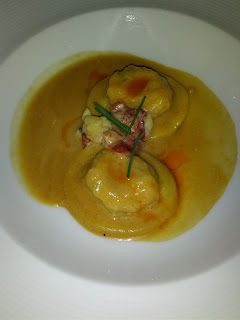 We ordered only one, and again, the kitchen split it three ways for us, presenting us each with a generous portion of two panzerotti and three chunks of lobster meat. I am a little skeptical that this was really just one order, as that would be a pretty sizable dish for just one of several courses on the menu, but I'm not complaining! The pasta was perfectly cooked al dente. It had a great chew to it. The filling was a generous amount of chopped lobster and had a lot of lobster flavor. The chunks of lobster meat on top were pretty standard. The sauce was again perfectly seasoned, salty, but in a great way. The drizzle of spicy olive oil on top added a nice kick. I thought this was good, but other than the strong flavor of lobster, I didn't get a lot out of this dish. Great execution, but I wanted something more from it. It was my 5th pick, Emil's 4th, and the other diner's 2nd. 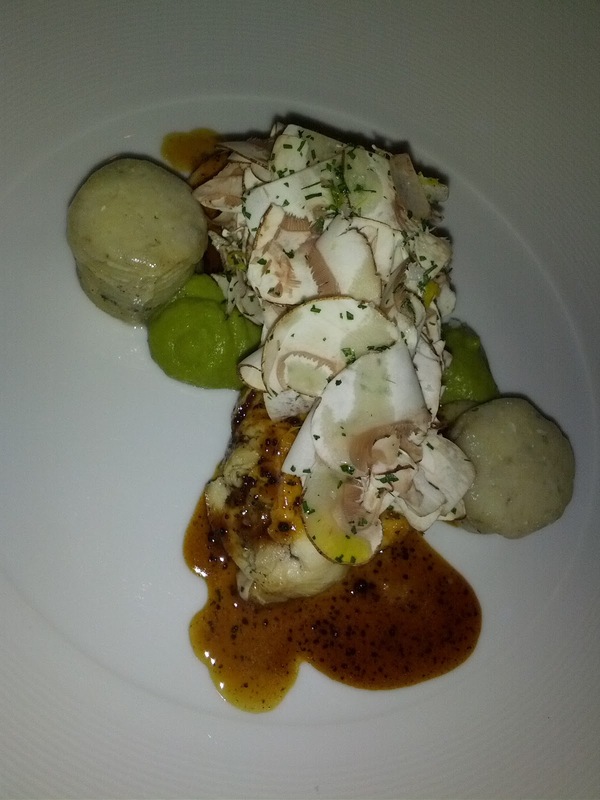 Third course: Truffle-stuffed chicken breast, leek custard, potato gratin, and shaved cremini mushrooms. This was the main dish from the classic menu. Since I had dictated every other course we ordered, I let my dining companions pick the main. I don't normally order chicken in a restaurant, but I figured if it was on the classic menu, it was at least going to be a very good chicken preparation. And it was. The chicken was pounded thin, then prepared sous vide and finished in the oven. It was perfectly moist. It was very good, but ... it was just chicken. Finished with a truffle madeira sauce, that had a lot less truffle to it than our other truffle dishes. 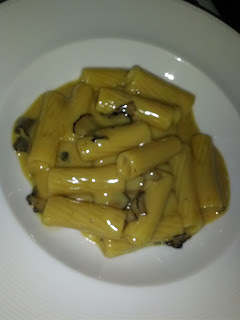 It was topped with plentiful shaved cremini mushrooms, which gave the dish a nice earthiness. The "potato gratin" was really just some chunks of roasted potato, fairly standard. The leek custard had a very strong leek flavor and was pretty creamy. This was the most modern of the dishes we had, incorporating sous vide and the leek custard. This was two of our least favorite dish and Emil's 5th pick, and I wouldn't order it again. Ridged pasta with foie gras, scented with black truffles and Marsala. And the dish that I'd read most about, from the classic menu. It was basically why we were there. It has been on their menu for something like 20 years and just gets the most amazing reviews! And perhaps for the first time, a dish that really lived up to its hype! This was amazingly good. I am so glad we ordered two of these. Any of us could have easily finished an entire order ourselves. Even the dessert-o-holic in me considered canceling one of our dessert orders and getting another one of these. I wish we had! Just writing this makes me drool. When this arrived, silence spread over the table as everyone took their first bite. One diner had his eyes closed, with a look of pure ecstasy on his face. It was worthy of these reactions. The pasta was perfectly cooked al dente. It wasn't anything amazing on its own, but execution was spot on, and it served as the perfect vehicle for the sauce. Oh the sauce. Words cannot describe this sauce. It was creamy. It was full of richness from the foie gras. Full of earthiness from the truffles, of which there were substantial shavings of. It had a slight sweetness from the marsala, which complimented the richness from the foie. This was just absolutely amazing. Once we were out of pasta, we soaked up every last drop of this sauce with the bread we had discarded earlier. Thank goodness we still had that, or I'm kinda certain we would have been licking the plate. I'd be willing to bet money on the fact that it has happened there over this sauce! This also paired so well with the bottle of red wine we were drinking, a 1998 Coppo Pomorosso Barbera d'Asti. The wine had a little too much tannen for my taste, but it worked really well with this dish. Hands down, winning dish of the evening. We all agreed. Would order again in a heartbeat, if I could. It will be interesting to see what they replace this with, after the foie ban begins. This is one of the top pasta dishes I've ever had. 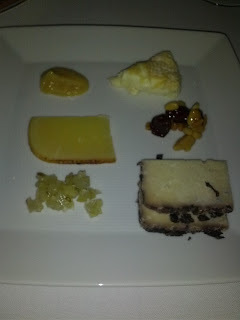 Cheese platter: pear mustard, Robiola delle Langhe, Bigio, honey with pine nuts, candied fennel, Testun al Barolo. Emil does not like sweets, but loves cheeses. And Acquerello is known for their cheese cart! In the same way that I was eyeing the petit fours cart all night, he was eyeing the cheese cart! When it came over, it had a selection of 9 cheeses: 3 hard cheeses, 3 sheep cheeses, and 3 soft cheeses. He selected one of each type. It was wheeled away, and the cheese returned paired with some fruit spreads and toasted walnut bread. Not being much of a cheese person, I just took a bite of each, and don't have a lot to say about them. My favorite, predictably, was the soft, creamy robiola. The accompaniments all seemed somewhat misnamed. The pear mustard really didn't taste anything like mustard, it was more like applesauce, but with pear. The honey with pine nuts was mostly pine nuts and raisins, perhaps coated with a little honey? The candied fennel was in little cubes, with a strong anise flavor, and not much candying. Anyway, the cheese lovers of the group seemed pretty happy with these selections, making this Emil's and the other diner's 3rd pick, and my 6th. Bourbon caramel semifreddo with Amaretti crumbs and drizzle of chocolate sauce. Dessert from the classic menu, that I'd read such rave reviews of. And since I love ice cream and caramel, I thought this would be a home run for me. Sadly, I didn't like it much. 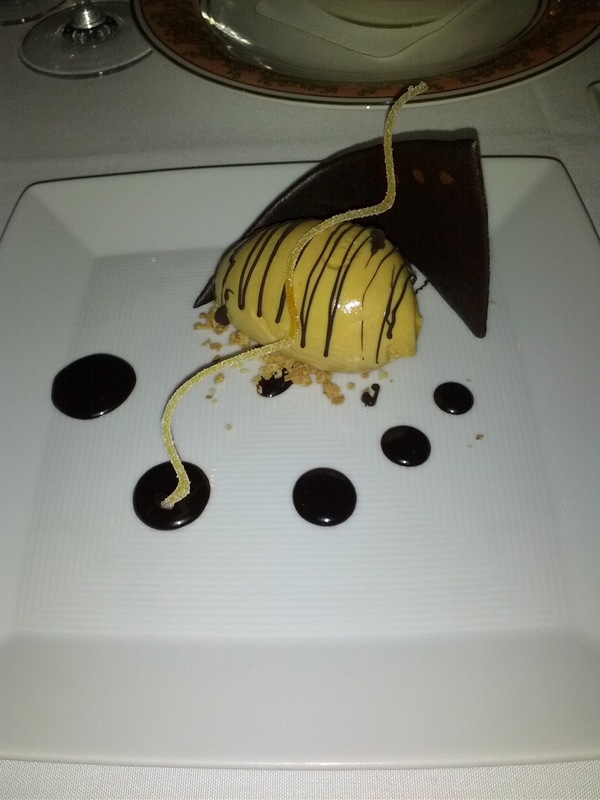 The semifreddo was a really creamy, almost perfect consistency. It had a strong caramel flavor that I really enjoyed. However, it was just far too sweet and I didn't pick up on much of the bourbon flavor. 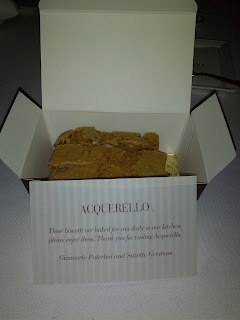 I liked the Amaretti crumbs, they had a great almond flavor, added a crunch, and went very well with the semifreddo. I also really loved the chocolate sauce, it was actually hardened on top, and very chocolatey. There was also what looked like a piece of chocolate, that turned out to be a very thin, very crisp, chocolate cookie. I didn't try it until the end, thinking it was just a piece of chocolate and I was trying to avoid too much caffeine in the evening, but I think it would have gone nicely with the semifreddo, perhaps cutting some of the sweetness since the cookie was fairly chocolatey and bitter. This dessert would have paired really nicely with a bitter coffee or espresso, something to cut the sweetness. My least favorite of the desserts, and second to last overall. Emil's least favorite, and 6th choice for the other diner. I would not order again. Crème fraiche panna cotta with strawberry granita, basil, and Marcona almonds. I love a good pudding/custard dessert, and as such, I've had a lot of panna cotta lately. This one was slightly above average, but not outstanding. The panna cotta had a balanced tartness from the crème fraiche, while still being sweet enough for my taste. It was a rather strange consistency however, kinda grainy. And served in this bowl, you didn't get to see it wobble (which, I'm pretty sure it wouldn't have). The bowl however was stunning! 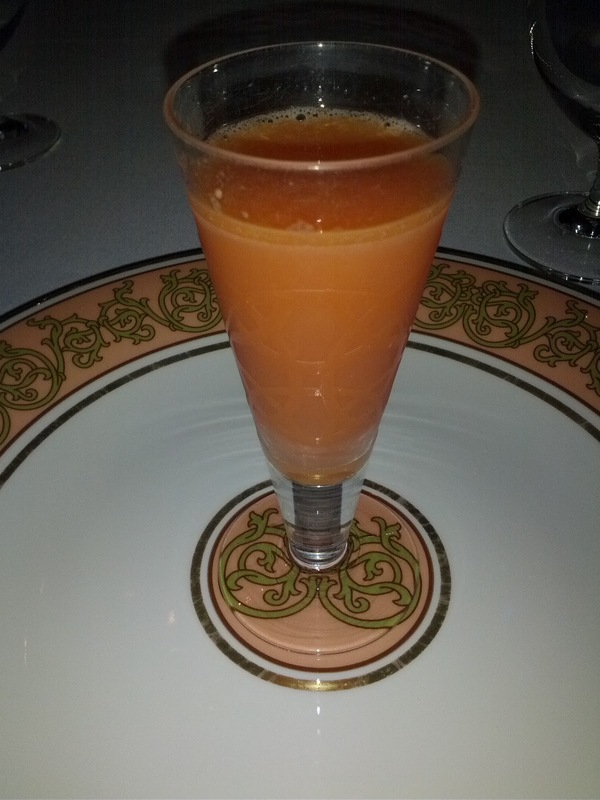 It was topped with two strawberry preparations: a granita and compressed strawberries. These were very sweet, very flavorful components. The compressed strawberries seemed like they had been infused with even more strawberry flavor! They paired well with the crème fraiche. The green dots were a basil puree, which was really intensely basil flavored and refreshing. It paired well with the strawberries in a savory way, but I wasn't really a fan of it. There was also a chocolate and hazelnut crumble. I loved this component. It not only added a great crunchy texture, but the chocolate itself had a really deep, rich chocolate flavor, and it paired so well with both the strawberries and the panna cotta. This single component really elevated the dish for me dramatically. Without it, I would have considered this a pretty generic dish. I think it could have done without the granita and the basil puree, and just been the panna cotta, the compressed strawberries, and the chocolate hazelnut crumble, but I understand where they were going with the fresher, ligher components as well. Emil liked the basil and the panna cotta, but found the strawberry components far too sweet, and did not like the chocolate hazelnut pairing either. My favorite of the desserts. I'd order again, but would probably rather try something else first. My 4th pick of the night, and second to last for the other two diners. Petit fours: chocolate cookie with chocolate cream filling, red currant gelée, white chocolate and orange ganche lollipop, St. George whiskey truffle, lemon curd and strawberry muscatto gelée parfait. Chocolate cookie sandwich: chocolate almond cookies, which were soft, but didn't have much chocolate flavor, filled with an equally uninteresting chocolate filling. Red currant gelée: ver sweet, with ok berry tones, but pretty generic, and it had too much sugar coating. White chocolate and orange ganache lollipop: the filling in this was strongly orange flavored, and I didn't pick up on any of the white chocolate. It had a really strange consistency and mouth feel The dark chocolate coating was high quality, with a good flavor and snap. I didn't taste the pink peppercorn that was sprinkled on the outside. St. George whiskey truffle: This was a standard milk chocolate shell, with a creamy boozy filling. Not remarkable. Lemon curd and strawberry muscatto gelée parfait: The curd layers were slightly tart from the lemon, but way too sweet. The gelée layers didn't have much flavor, or else it was just masked by the curd. On top was some pistachio crumble that I suppose paired well with the curd, but I don't really care for pistachio much. 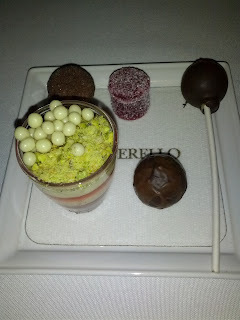 There were also white chocolate pearls that were the best part of the dish, but weren't exactly remarkable. This was very hard to eat, as even with the tiny spoon provided, dipping it into the cup caused the pearls and crumble to split out everywhere. I wouldn't want a single one of these again. These were by far the weakest part of the meal. I love my desserts, but I didn't actually like any of these, even slightly. Take home treats! Almond biscotti. With the check, we were presented with a box of take home treats. Of course I couldn't wait to open it! Inside was a pile of freshly baked biscotti. I generally find biscotti fairly forgettable, usually just kinda hard, not very flavorful. I enjoy a chocolate dipped biscotti from time to time, particularly when dipped into the froth of a cappuccino, but besides that, biscotti is not something I really care much about. These however, were very good biscotti! They were slightly softer than I am accustomed to, perhaps because they were freshly baked that day. Good amount of almond chunks in them. Very buttery. Really quite tasty, even without a cappuccino. The Melt is a fairly new grilled cheese/soup shop that opened in my office building a few months ago. They have several other locations around the area as well, with ambitious growth plans. They have been open only for lunch and dinner until now, but their breakfast menu debuts on Monday. 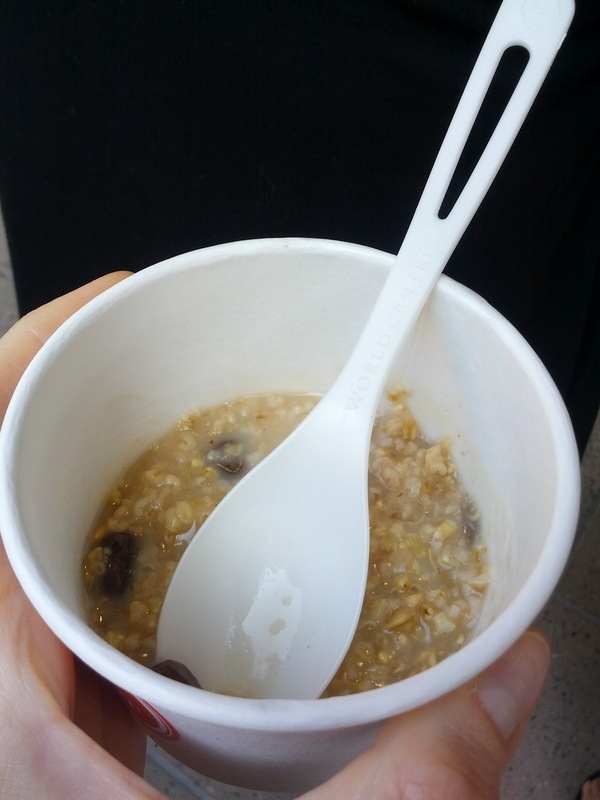 As a preview, they were giving out free oatmeal and breakfast sandwiches to everyone who works in the building today. They did this back when they originally opened with their grilled cheese and soup as well. Since I never published those reviews here, I've included them below as well. I desperately wanted this place to be good (grilled cheese and soup at my doorstep would be fantastic!) ... but it hasn't impressed me yet. The cheese was consistently melted well! Most of my unhappiness here was just in the fact that I didn't get to pick my cheeses, so since I don't like jack cheese, I disliked the colby jack and the jalapeño jack (but the jalapeño jack did have a really nice layer of real chilis!). The brie was a pretty standard brie. I'm still interested in trying the sharp cheddar and the provolone/fontina. The bread itself was pretty generic and standard. The herb layer on the outside also didn't really seem to add much. Again though, I had the sourdough and the white wheat, which I wouldn't pick. I'm interested in trying the potato, the 8 grain, and the garlic. Overall, not offensive, but not good either. They were ruined by soggyness. They need to be crispier. Perhaps less butter. The butter level was pretty nasty, but it is hard to tell if it was just too much given the sogginess and if it would be good once crisped up. Jalapeños and apple butter spreads were pretty good. 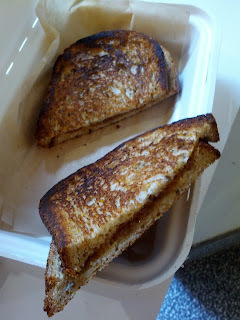 All were decent - not worth going out of your way for, not worth getting on their own, but paired well with melts. Purees work well for dunking. Served a little too cold. I did leave the meal with an overly salty feeling in my mouth however, and I think it came from the soups. These were well done. I do recommend getting one of their suggested pairings - they clearly put thought into what flavors combine well, and if you like dunking your sando in soup, these worked well. Sum of the parts is greater than the whole! I've been excited for this place to open as it is uber convenient and I've read a lot about their crazy high tech machine that is supposed to make the perfect grilled cheese (cheese melted perfectly, bread toasted perfectly, in under 1 minute). They also do online ordering - you scan a QR code on your phone when you walk in the door so they start making it when you get there, etc. Sounds very promising. Today they were giving out free combo lunch meals to people who work in the building. To handle the crowds (I assume) they were doing it mass production style, so you didn't get to choose what you ordered and they just kinda handed them out in batches. So, keep that in mind as my experience will be different than a standard ordering experience. The menu features 5 grilled cheeses ($5.75), 5 soups ($3.95), all puree style for easy dunking (two tomato basil, sweet corn tortilla, spicy black bean, italian sausage and pepper, and creamy wild mushroom), cookies, drinks, and 3 sweet dessert sandwiches. Full menu here. They also recommend combo meals ($8.75) that pair a sando and soup and include some chips. You can always add bacon or tomato to any sandwich (for free). 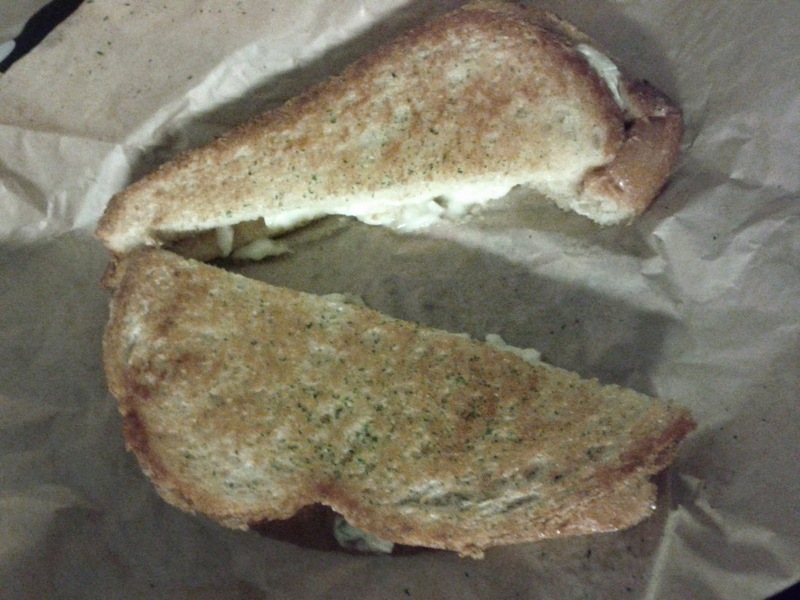 Of the grilled cheeses, there were three grilled cheeses I wanted to try: sharp cheddar on potato bread, fontina & provolone on garlic bread, and brie and apple on white/wheat, one that I wasn't all that interested in (colby jack on 8 grain), and one that I really didn't want: jalapeno jack on sourdough (jack is probably my least favorite cheese and sourdough my least favorite bread!). Of course, the one they had for lunch was ... jalapeno jack on sourdough :) So, take my review with that in mind. "The Mission" combo meal, $8.75. The packaging included a cute a little binder clip on the bag ... uh why? The chips were just standard, greasy, forgettable. Sweet corn tortilla soup. $3.95. The Misson combo included the sweet corn tortilla soup. I thought the soup was better than the sandwich. It had a nice corn flavor, but certainly wasn't anything I'd ever go out of my way for. I didn't really get the "tortilla" aspect of it since it was a puree. I probably wouldn't like it eating it on its own, but I don't think they really intend for anyone to just get a soup here, I think that is why they are all purees. Dunking the spicy jalapeño grilled cheese in it did work very well, I see why they recommend that pairing. This was a case where both elements were certainly better when combined. Jalapeno jack on sourdough. $5.75. The sando did have a nice kick to it - I'm not sure if there was a jalapeño spread on there, or if all of the jalapeño chunks came from the cheese, but there was a healthy layer of jalapeño that was quite nice. The cheese was melted well. One slice of bread had an herb coating on the outside, the other was plain. Both slices were buttered up quite a bit. But ... it was soggy and not crispy, which was a big fail, as that is what their fancy machine is supposed to do right? Maybe it got soggy in the walk back (3 mins)? The bread being so soggy really made this not very good. I see the potential since I did like the jalapeño flavor, but the buttery/soggyness just ruined it. I'm guessing that since both the cheese and the bread weren't the ones I'd choose, this was even a bigger issue for me since the flavors didn't save it either. I went back for dinner, since they were offering free dinner for my apartment building! Like earlier, there was no choice in ordering, so again, I am reviewing things I would not normally order. "The Outlaw": Colby jack on 8 grain bread with spicy black bean soup. My last pick of soup paired with my second to last pick of sandwich. "The Parisian": Brie and apple butter on white wheat bread with creamy wild mushroom soup. Colby jack on white wheat bread. $5.75. As I mentioned before, I do not like jack cheese. At all. And colby jack is even worse than jalapeño jack, since the jalapeño jack at least as the jalapeños to give it a kick and something interesting. This sandwich is normally served on an 8 grain bread, which sounded hearty and good to me, but they were out of that and it was served on a bread they called white wheat. I kinda hated this sandwich. Slightly less soggy than the one I had earlier, but still not crispy, way too buttery, full of cheese that I found repulsive, on truly boring bread. 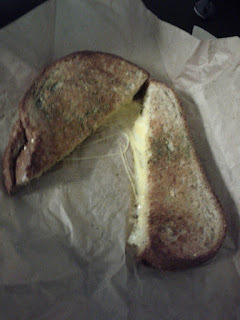 The cheese was very nicely melted however, and it included the spices on the outside again. For me, this was not good, but if you like colby jack, I'm sure it was fine. 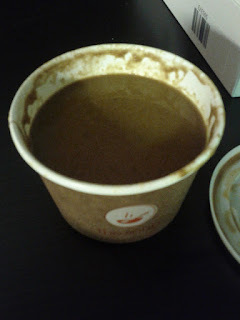 The spicy black bean soup was much better than I expected, although this is not a soup I'd normally ever order. It had decent spices and did combine well with the colby jack. Again a case where I see why they recommend the pairing, and where the soup and sando are both much better together than they are on their own. The soup was flavorful enough to eat on its own too. Decent brie and a decent apple butter that complimented each other nicely. I liked the sweetness from the apple butter. The sandwich was again soggy however, and again way too buttery (don't get me wrong, a nice crisp buttery grilled cheese is a fantastic thing, but in this case, the butter just contributed to the sogginess). 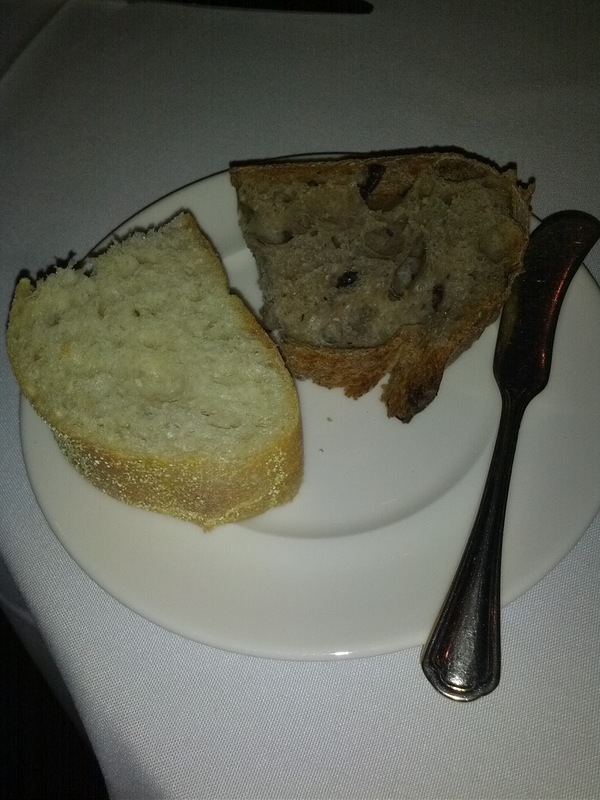 The white wheat bread was pretty boring but not bad, per se. Creamy wild mushroom soup. $3.95. The creamy wild mushroom soup was decent and had a strong mushroom flavor. In this case, I did not like dipping the sandwich in it, as the mushroom flavors just overpowered the brie and apple. It was definitely more of a standalone soup. 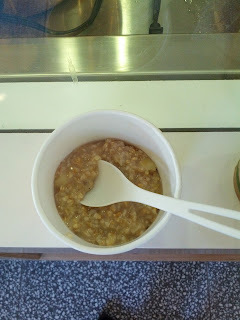 Maple raisin oatmeal (sample size). The oatmeal itself seemed undercooked, strangely crunchy. There wasn't much maple flavor. Plentiful raisins. Would not order. Cinnamon apple oatmeal (sample size). Again, the oatmeal seemed a little undercooked, but not as much as the maple raisin. There were little apple chunks throughout. The flavor seemed off, it was cinnamon, but really wasn't very good. This was kinda gooey, a really unappealing consistency. Definitely would not order. This was decent. 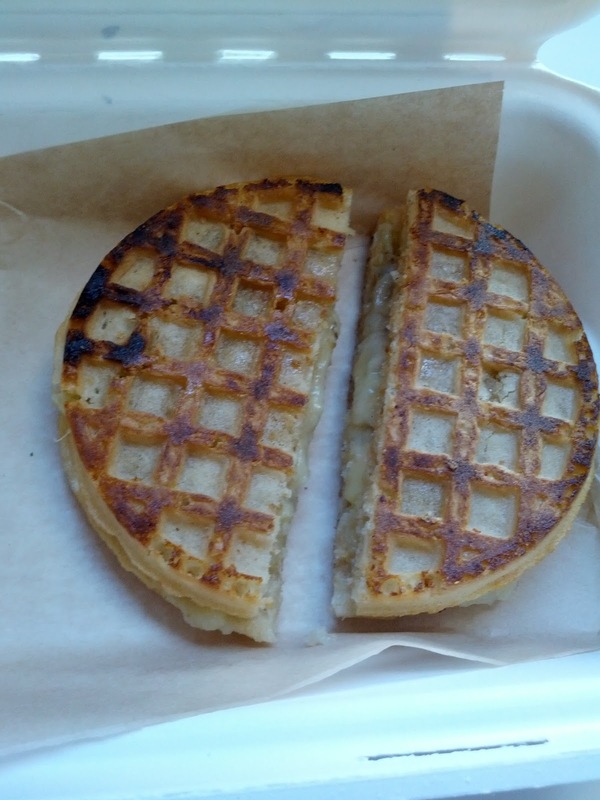 Two crisp waffles, filled with sliced banana, grilled. The banana got really soggy from the grilling process however, which made it a little unappealing. The waffle had a subtle maple flavor to it, but it also came with a side of maple syrup to dunk everything in. The syrup definitely made the dish! 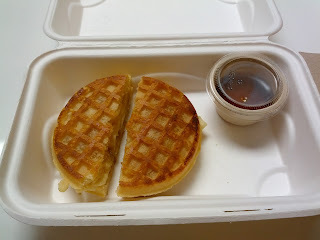 It wasn't particularly good maple syrup (I'm a bit of a snob in this area, having grown up in New Hampshire with family that makes their own), but it really did compliment the waffle and banana quite well, and added some needed sweetness. The waffle was surprisingly crisp. I'd consider getting this again. This time I liked it much less. The waffle wasn't nearly as crispy as the previous time, and it didn't have much flavor. The banana was sliced fresh to order, which I really appreciated, but it was again warm and soggy since it was inside the waffle, which is just a little weird. The syrup was again the best part, but not particularly flavorful. I think some peanut butter inside of this would go a long way ... mmm! I won't get this again, but it did make me appreciate a few things about The Melt. Even though I am too much of a snob for their syrup, I am glad they use real maple syrup and not fake stuff. And I like that they slice the banana to order, or in the case of the egg in the hole, crack an egg to order. They do have a good commitment to quality. This is on their lunch/dinner dessert menu as well. 8 grain bread, filled with Biscoff spread and fig jam. I love a toasted PB&J so this sounded great! Unfortunately, it failed in exactly the same was as all of their regular grilled cheeses: too oily/buttery on the outside and kinda soggy. The bread had a decent heartiness to it, but was fairly unremarkable. The fig jam was good, with lots of fig flavor. I didn't taste much of the Biscoff spread. (Biscoff spread is sorta peanut butter-like, made from Biscoff cookies, those pretty boring, hard, graham cracker-like speculoos cookies that are often served with coffee). There wasn't a lot of either spread, it could have used more. Would not order again. 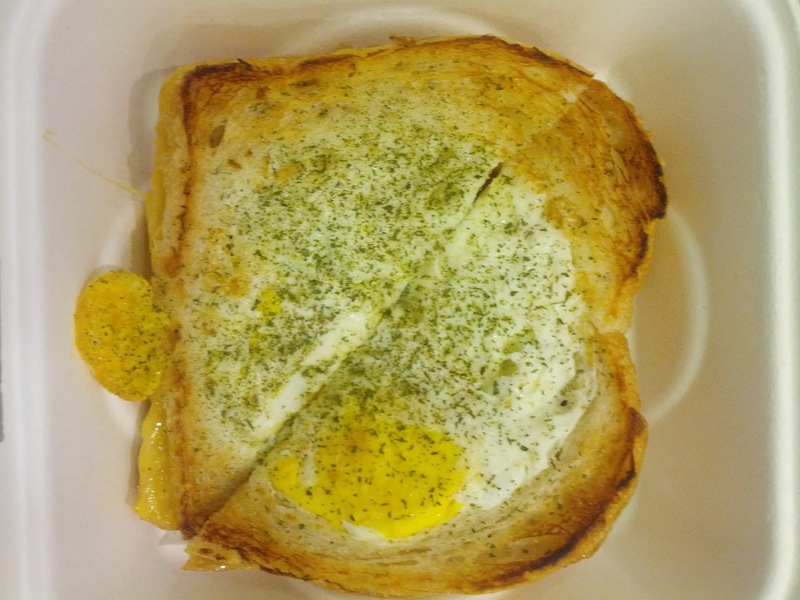 "Egg in a hole". $4.25. Wow! This was actually really good! 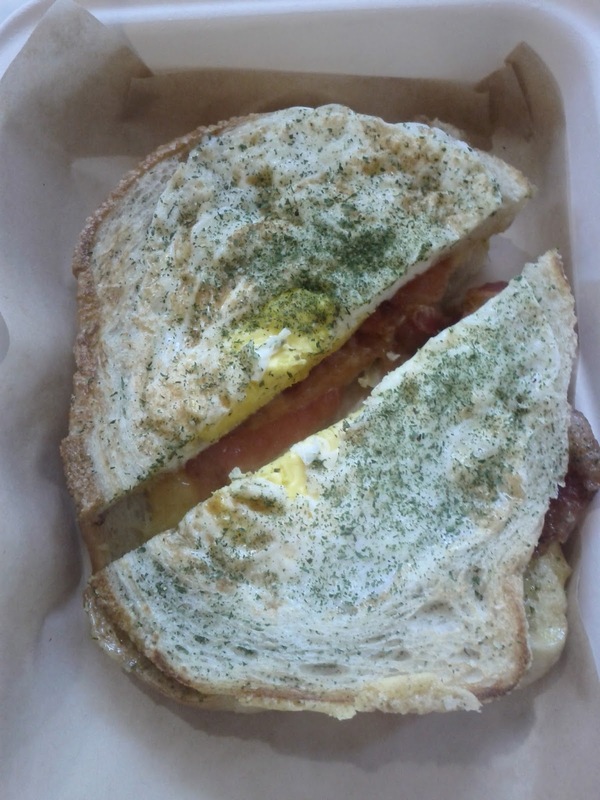 White wheat bread, sharp cheddar cheese, optional bacon/tomato, and then egg cracked into the hole. This is their classic grilled cheese, made with their standard white wheat bread and aged cheddar cheese. But then, they cut a hole in the top piece of bread and crack a fresh egg, to order, into it. The whole thing is then put into the grill, which manages to fry up the egg nicely. I was pleasantly surprised at how well the egg came out, with a crispy exterior where it had touched the grill. Sure, I'd prefer a slightly runny yolk, but this was nicely cooked. The top was brushed with a salty herb mix. The seasonings went perfectly with the egg. The inside was where it shined. The cheese was just perfectly melted. I can't say I've ever ever had cheese this perfect in my life. It oozed out, coating the egg, coating the bread, just amazing. I also added bacon. It wasn't quite as crispy as I'd like, but was smothered in cheese and pretty delicious. My co-worker added tomato and said that was quite good as well. Like all of their sandwiches, I would have liked the bread to be crisper, and again blame this on the amount of butter/oil they slather on the outside, but it was certainly the best sandwich I've had from there. I'd order this again. I got the egg in a hole again, after having liked it so much the first time. This time, it wasn't nearly as good. The bread was again too soggy, and buttery/oily. The egg was overcooked and uninteresting. The cheese was again absolutely perfectly melted and rather amazing, but needed to be consumed within moments of it coming off the grill or it lost that quality, and the congealed cheese was really nothing special. The bacon as the winning ingredient. It had a really amazing flavor, and went so well with the cheese. It was the bacon that kept me eating this after it got cold and unappealing. I'm not sure why the magic was lost on this one. The machines are all using timers and are calibrated the same, so it should be exactly the same as my first one. If I go for breakfast again I'd still consider getting this, but I won't be going out of my way for it. Cinnamon raisin with lemon cream cheese. $4.25. This was decent cinnamon flavored bread with some raisins in it, nicely grilled and crisp. The cream cheese inside had a subtle lemon flavor but a really bad mouth feel. I didn't like the cream cheese at all. Perhaps it was just strange from being served warm? Would perhaps try again, as I really wanted to like this one. As you know by now, we have been trying to fit in all of the foie gras eating that we can, before the ban goes into effect. And while I'd love to have it all as huge multi-course formal meals, that isn't really practical ... those sorts of meals are lovely, but are a big time investment, are rather pricey, and are really too much to do every single night of the week. Luckily for us, many restaurants have amazing lounge and bar spaces, where they serve their foie! I'm a big fan of lounge dining, as it allows us to have a quicker meal, customize the size of it to our needs, go on a whim without reserations, and still get amazing quality food. So when Friday night rolled around, and we hadn't had any foie for almost 24 hours, we headed to La Folie's lounge! We arrived at seemingly the perfect time, seated easily at the bar. This very quickly changed and the place was full and hopping within 15 minutes. The atmosphere was lively, but not too loud. I've been to their lounge once before, but only had one foie dish that time, as we'd just come from a multi-course foie dinner the night before. I'll skip all of the basic review details here since you can read them in my last post, and focus instead on anything that was different, and review the individual dishes below. The lounge provides a plethora of options for food; you can order off of the lounge menu, or pick anything from the main menus, including the tasting menu, a la carte, or mix and match as you choose. I really appreciate this flexibility! The lounge menu features upscale comfort foods (truffle and lobster mac and cheese, lobster croque monsieurs, truffle and caviar deviled eggs, etc). However, this is clearly no standard bar fare and every dish is actually prepared to order, right in the bar area itself, by a single chef. Since we were seated at the bar, we were able to watch the food preparation directly in front of us. It was really impressive how quickly he churned out these dishes, and how much of them was prepared from scratch. The gougeres were stuffed with emmentaler cheese at ordering time, popcorn freshly popped for each order, etc. The quality of ingredients was also impressive, they were not skimping in any way. The lobster croque monsieur had a very, very generous amount of lobster meat in it, and was large chunks of claw meat at that. The truffle popcorn had real truffles shaved to order on top of it. This is very high quality bar food! The lounge food all sounded, and looked, great, but we were there with one goal: more foie! So we ended up picking 4 dishes from the main menu to share, which they priced as just a standard 4 course meal, $90 (they also offer 3 course for $80 or 5 course for $90). This was generous, as we were splitting the dishes, and they still included multiple amuse bouches for each of us. Well priced for the quality of the food. Anyway, this was all very high quality food, executed well. There are about a thousand things on the menu that sound amazing, and a number of my friends have recently dined in the main dining room to rave reviews (and seriously drool-worthy photos! ), so I will certainly need to check out the formal dining experience soon. And I'll definitely go back to the lounge, as it is one of my new favorites! From the lounge menu. 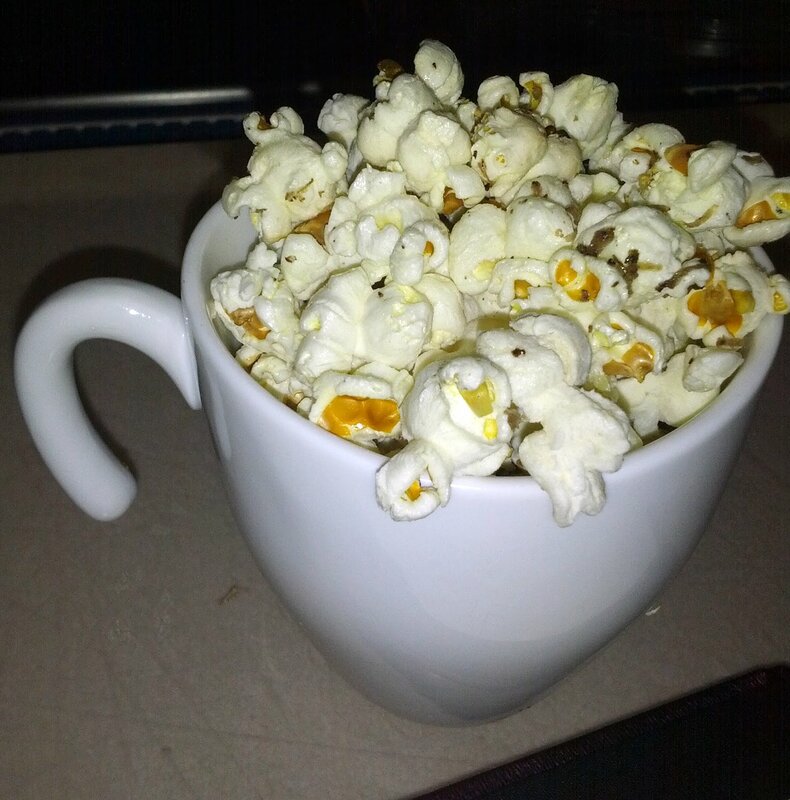 You'd never know from looking at the menu that this was not just going to be pre-popped generic truffle oil popcorn! Like all lounge snacks, this is prepared to order. We watched the lounge chef prepare this dish directly in front of us, starting with corn kernels on the cooktop, freshly popping the popcorn, and then shaving truffles over the top. He overheard my exclamations in amazement that it came with real shaved truffle rather than just truffle oil, and gave us a sample cup. The real version of this is a much bigger serving, but is only $6, which is a little shocking given the truffles that were being shaved onto it. Amuse bouche #1: braised shortrib aspic. 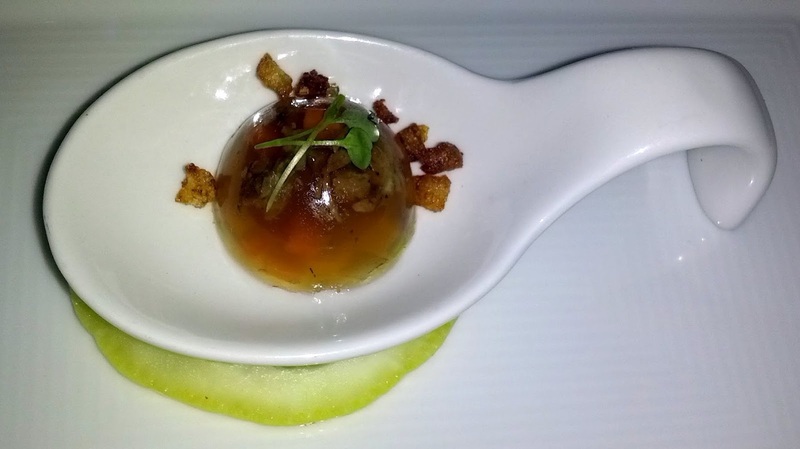 La Folie always starts with an amuse in a little spoon, even if you are lounge dining. Tonight's treat was a braised shortrib aspic. This was such a flavorful little bite! It was like a beef stew, all wrapped up into one tiny gelee. Inside the aspic was shortrib, mirepoix, and leeks. It was topped with crispy potato bits. The texture combination from the gelee and the crunchy bits made it fun to eat, and it was beautiful, somewhat translucent so you could see the goodies inside. But the flavor really was the most amazing part, it was so incredibly meaty! It reminded me of that scene in Willy Wonka and the Chocolate Factory where Violet has the gum with the beef stew and mashed potatoes and gravy in it ... just so surprising to have so many components and flavors in such a tiny bite! It wasn't really a light start to the meal, but was really interesting. Amuse bouche #2: Slow cooked egg yolk, fennel potato cream, crispy potato chip, chive, brioche toast. And La Folie always includes a second amuse bouche, a preparation of a slow cooked, barely poached, egg yolk. The puree/cream inside changes frequently. Served in an egg shell that has the top cut off, topped with a crispy potato chip, with a chive sticking through it. And a brioche toast to dunk into it. You might think that all eggs are sorta created equal, but that is just not true. The flavor in this, the "yolkiness", was just very intense. I think this was a quail egg, but it reminded me a lot of the jindori egg I had in tamago at Ichi Sushi, so much more rich, flavorful, and custard-like than standard chicken egg! It mixed so well into the potato puree, adding even more richness to the already creamy puree. It was almost a little much to eat just by the spoonful, but dunking the perfectly crispy brioche toast into it created such an amazing bite. It was like brunch - toast, eggs, potatoes - but uh, soooo much better! The potato chip on top was perfectly crisp, like the most delicious potato chip you'd ever have. Both of these amuses were serious flavor punches! Such precision goes into creating this. 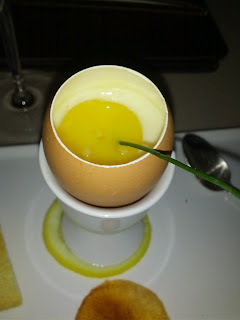 The top of the egg shell is perfectly cut off, the potato chip has a tiny hole in it for the chive to stick through, the serving vessel is on top of a slice of lemon. I love how much care went into this, as it was a strong signal of the quality level they strive for. 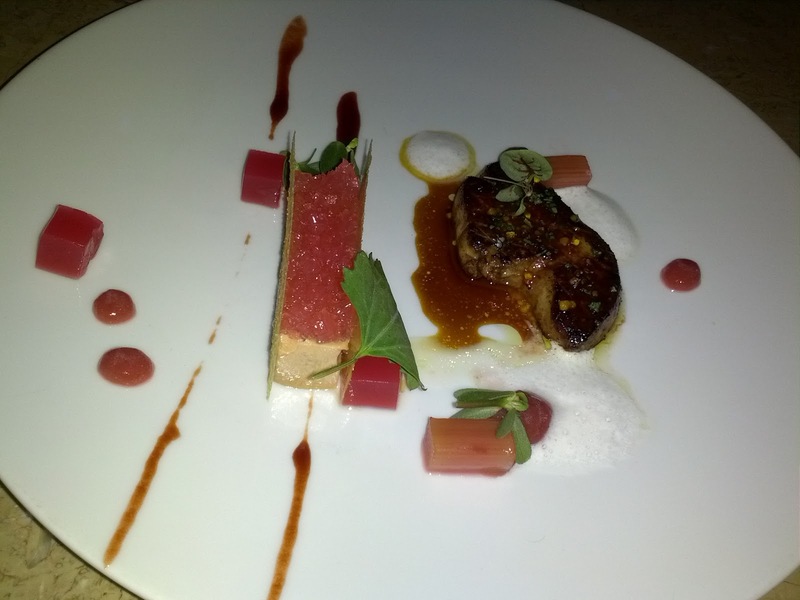 Hudson Valley Foie Gras Torchon with Smoked Apple Barbeque Glazed Squab, Caramelized Onion and Strawberry Compote. And ... the main reason we were there! La Folie is known for their foie gras, and the seared foie gras in particular, but I'd basically had it last time I was there (in a slightly different preparation paired with a foie gras soup), and we were going to have some seared on the scallop dish, so we opted for the torchon instead this time. The torchon was creamy, and good enough, but like all the torchons I've had lately, just didn't have enough foie flavor for me. It was very smooth, a wonderful consistency, and clearly a high quality product. Accompanying the foie was a chunk of smoked apple bbq glazed squab. Now, I wasn't really excited for squab. Not something I order, as it is too gamey for my tastes, but I think I'm starting to come around. To me, this was actually just like a more flavorful chicken. The glaze on it was amazing. Sweet, smokey, delicious! I didn't really get the pairing with the foie however, I'm not really sure why I'd want squab with my foie, or vice versa. 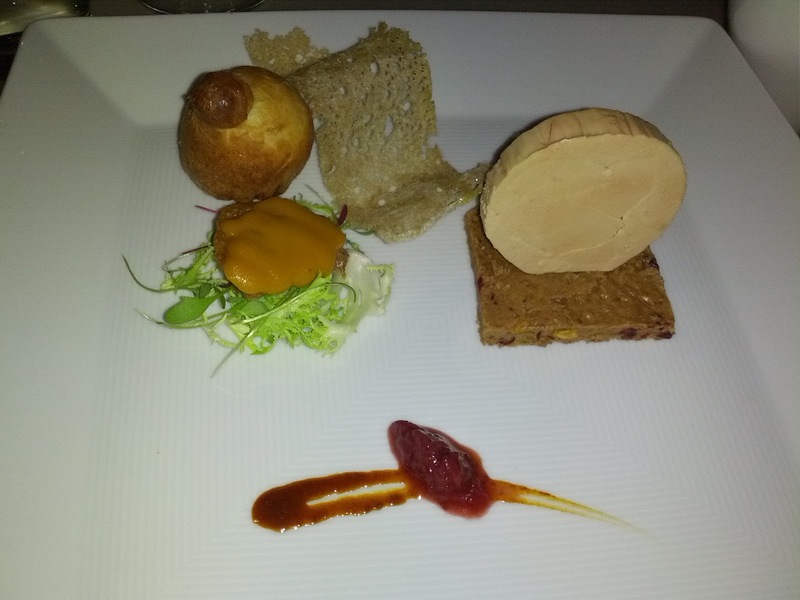 We then had 3 different bread-like components to choose from on the plate to spread the foie on. The first was a very thin crisp cracker, that was very wheaty-tasting. I didn't particularly like nor dislike it. Next was a little fluffy brioche roll. It was cute, but just a fairly standard piece of bread, a classic pairing with the foie. But the final one, which the foie was perched upon, was amazing. I'm not quite sure what it was, some form of nut based bar. It wasn't nearly as solid as it looked, instead really creamy and smooth, yet with crispy texture as well from the ground nuts. I'm not really sure how they created this consistency. It tasted like the most amazing peanut butter I'd ever had, but I'm pretty sure there was a mix of nuts in there (pistacchio perhaps?). The final component on the plate was the strawberry compote. It was sweet and was a good pairing with the foie. But what it really paired well with was ... the nut bar thing! As in, classic pb & j! I couldn't get enough of a bite of the nut bar, foie, and strawberry compote together. Sweet, salty, rich, amazing. Peanut butter and jelly, elevated to a whole new level. This made me really, really wish I'd been able to try the "Elvis Lives" at Lafitte before it closed - a peanut butter, muscato jam, foie gras, and bacon sandwich! Even though the torchon itself didn't wow me, the pb&j pairing more than made up for it, and the glaze on that squab was sooo tasty. I would order again. My second favorite savory dish of the night. Triple T Ranch Tempura Duck Egg, on Sweetbreads Pancake, Frangelico Almond Pesto, Wild Mushroom Salad, Truffle Vinaigrette. This was the one non-foie dish we ordered. Several of our friends recently had this dish, and highly recommended it. I wish I had a photo of cutting open the egg. The tempura gave it a crisp exterior, and it was just lightly battered, not too oily. The white was fully cooked, but the yolk was just perfectly oozy! Amazing execution. It was perched atop a savory pancake, that had a rich earthyness to it, with little chunks of sweetbreads. Also on the side of the plate was a little salad, made up of crisp frisee, well cooked wild mushrooms, and shaved asparagus. It was simple, fresh, and topped with an amazing truffle vinaigrette. I'm not usually a big salad person, but this was really good. It was served warm. And then of course there were some pretty decent sized shavings of black truffle. Another well executed, flavorful dish. 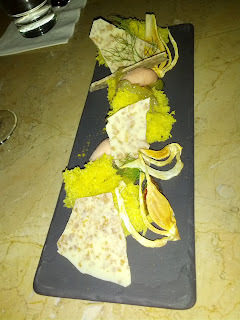 My least favorite savory dish of the night, but I didn't dislike it, the others were all just better. I'd skip it in the future to try some of the other amazing sounding dishes though! Seared Day Boat Scallop and Foie Gras Rossini, on Seared Yukon Gold Potatoes with Truffles. And the other main reason we were there. I love a good seared scallop. And one with seared foie gras on top? Even better! This is the dish I was most looking forward to. The scallops were huge, perhaps the biggest I've ever seen. They had a good sear on them, and were tender, but slightly over done, I prefer them more medium-rare. The seared foie was also a really sizable portion, particularly for just being the topping. Like the scallop, it had a good sear on it. It was creamy, a nice piece of foie. There were also two layers of seared potato, one under the scallop and one under the foie. They were well cooked, fluffy on the inside and crispy on the outside. I could have done without them however, as the potato flavor seemed to detract from the scallop and foie. They went nicely with the salty, rich sauce, sort of like gravy, but I didn't actually like the sauce much and particularly not with the scallop, as it was overpowering. The potato/scallop/potato/foie tower was held together by a rosemary skewer. I wasn't really sure if we were supposed to take off a little of it and eat it, or if it was just inedible garnish, serving function only, and perhaps having infused some flavor it in already? The asparagus spears were perfectly cooked, with a good crunch. I'm not quite sure where the truffle was in this dish, perhaps in the sauce? I didn't taste it regardless. 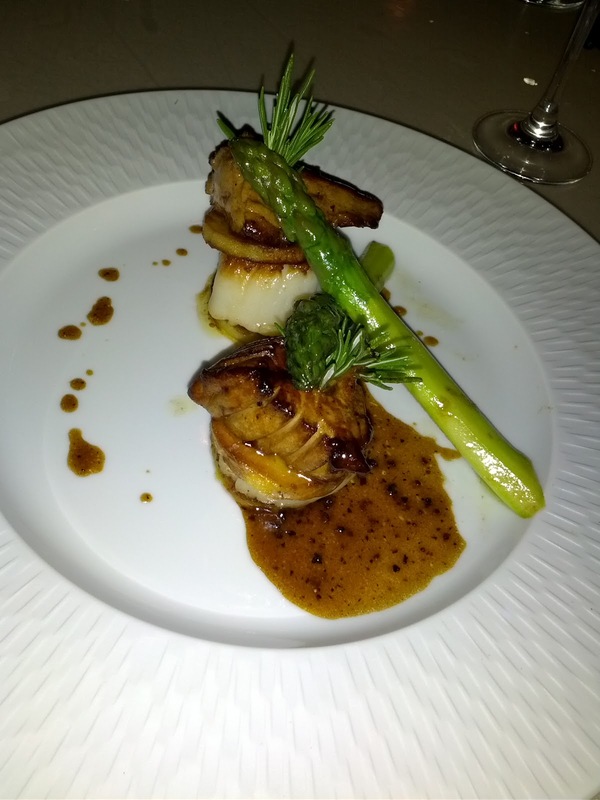 This dish reminded me of the one that the chef at Fly Trap created just for us, where he added some small chunks of seared foie gras to the top of the seared scallop dish, also served with asparagus and potatoes. That was a last minute creation for us, and didn't involve nearly as much foie as this dish however, so this was much better. My favorite dish of the evening, and I'd order again. My only real criticism, besides the doneness level of the scallops, is that everything on the plate was also just a little too oily. Bittersweet Chocolate and Foie Gras Mousses On Crunchy Feuilletine, Hazelnut Praline Sponge Cake, Cassis Gelée, Bacon Ice Cream. The hazelnut praline sponge cake was fluffy and had a strong hazelnut flavor. But like the curry sponge cake we'd had the night before, this just didn't do it for me, as I find that style of cake pretty boring. The main component was the four layer mousse cake. The bottom layer was a chocolate and hazelnut feuilletine, that had a nice crunch to it from the nuts. 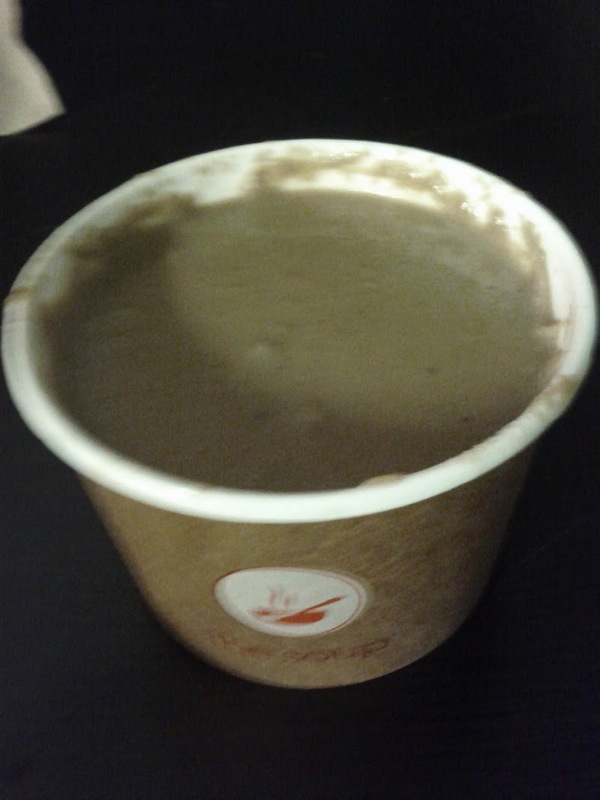 The next layer was the chocolate mousse, which was pretty unremarkable, not much chocolate flavor. 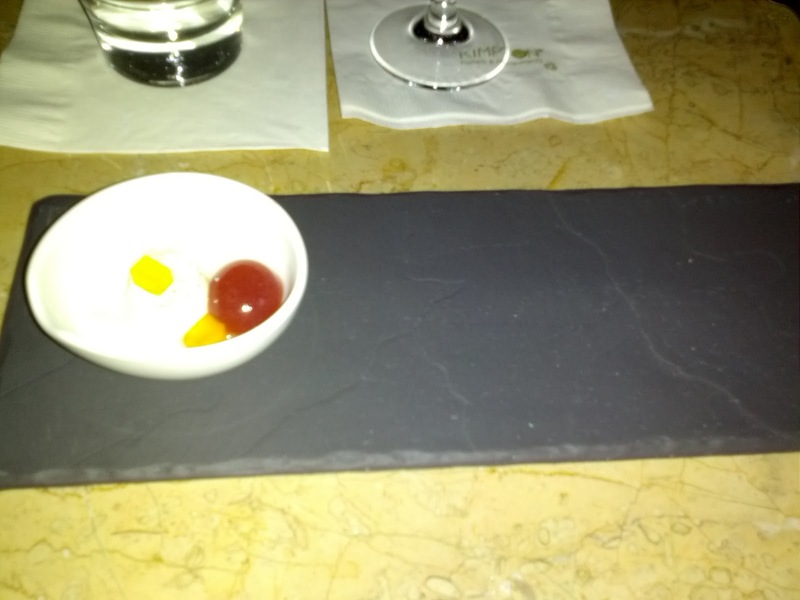 Next was the foie gras mousse, which had very, very little foie flavor. It was incredibly disappointing. 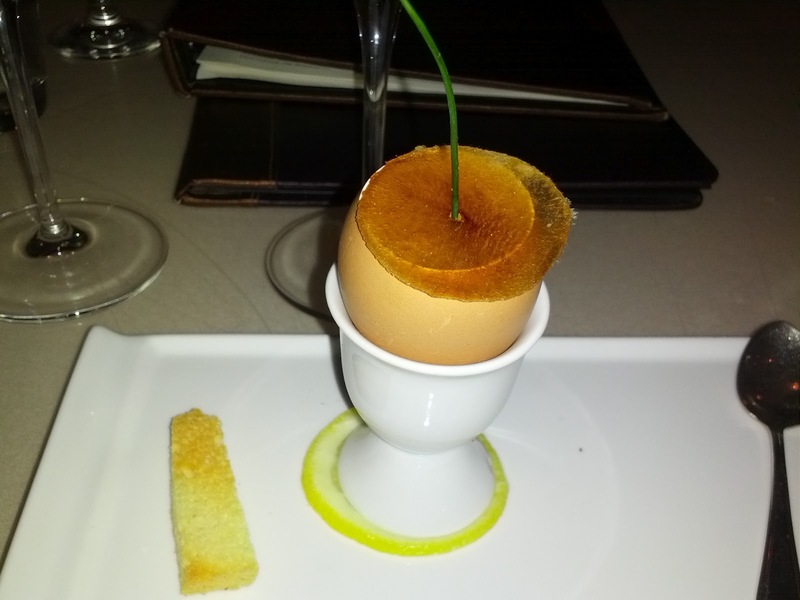 I love foie gras mousses, and this just had very little to offer. The top layer was a sweet cassis gelee. It was adorned with some foie powder that wasn't very flavorful, nothing like the intense foie powders we have had various times at Alexander's. There was also a dark chocolate ring, high quality, tasty chocolate, smooth, with a nice snap to it, probably the best part of the dish. There were also some cassis "caviar", that were sweet and had a nice pop to them when you bit into them. And finally, the bacon ice cream. Well, unlike most everything else on the plate, it did indeed have flavor. It tasted incredibly like bacon. It was really quite gross. This was just not a good dessert. The foie flavor wasn't there, and even if it was, I'm not convinced it would have gone well with the chocolate. Add in boring cake and nasty ice cream ... not successful. I give them credit for originality however, but I'd never get this again. It is rather amazing that I've never reviewed Sushi Zone before. 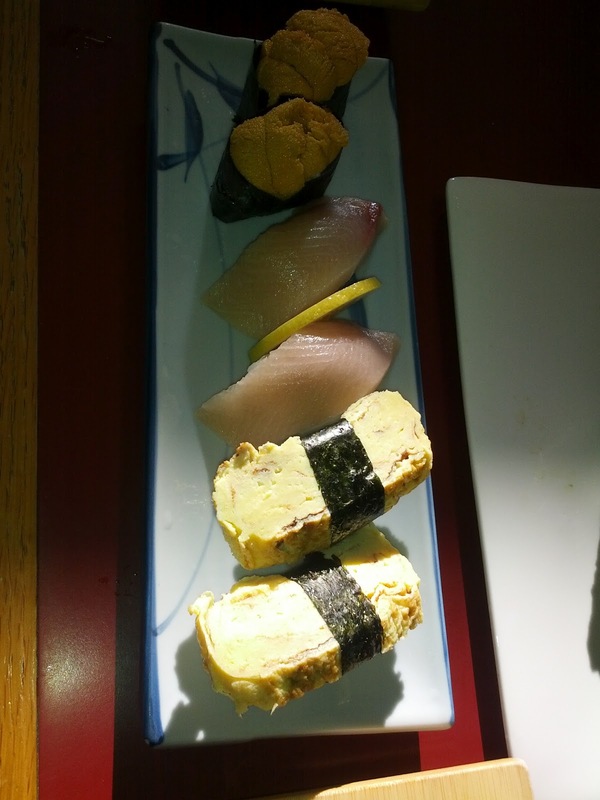 It is the sushi restaurant that I have been to far more than anywhere else. In fact, perhaps the restaurant I've been to more than anywhere else. Back in the day, we used to go here pretty much every Sunday night. Since moving to another part of town, and them closing on Sundays, I make it back much less frequently these days, perhaps only going a handful of times a year. I still enjoy it for nostalgia sake, but things have kinda gone downhill, and I'm just not quite willing to deal with the hassel on a regular basis. Ah, the hassel. Sushi Zone is a tiny place. 2 booths that seat 4 people and a sushi bar that seats perhaps 10. I think my average wait time to get seated there is somewhere around 2 hours, and my average time to get sushi after getting seated is around 1 hour. I used to find this just part of the experience, somewhat endearing, and always went planning on it, so we'd go far earlier than we wanted to eat, and let our hunger build as we waited. Now I kinda just can't be bothered to wait that long, when there are great dining options that are much easier! Back in its glory days however, the wait was totally worth it. For first timers, let me teach you the waiting game: Put your name on the dry erase board and then go stand outside on the sidewalk in the freezing cold San Francisco night. Count the number of groups ahead of you. Count the number of folks waiting outside. Try to guess which party is which. Obsess over whether the people whose names are on the list who aren't there will return in time or not. Cross your fingers that they won't. Guess which table you'll get. Stare at everyone slowly eating their sushi inside. Ponder about how the restaurant next door that has never once had a single customer in it possibly affords their rent - conclusion, this place is clearly a front. Repeat. The staffing is also minimal. A sushi chef, an assistent, and a waitress. When I first started going to Sushi Zone years ago, there was a single sushi chef who worked all nights, and was amazing. He then took on a second chef who started working some nights, and wasn't quite as good. Then he took on a third, who has been there every time I have in the past year or so, who just really, really isn't good. His rolls are poorly rolled and fall apart, the pieces are too big to fit in my mouth, and there is just way too much mayo. We've tried to go on a number of different nights to get one of the other chefs, but haven't managed to yet. Speaking of going on different nights, yes, we went to sushi on a Monday. Now, I pretty much never get fish on Mondays, even cooked fish, unless it is local or I know it is fresh. Most sushi restaurants aren't open on Mondays, for good reason. I recently learned from another sushi restaurant however that they do receive some shipments on Mondays from New Zealand and locally, so I called Sushi Zone to ask if they received fresh fish on Mondays. They assured me that they did. Sushi Zone opens at 5pm, and people line up early to get in the first seating. During the week, there is pretty much no way we could ever make it there that early, so this isn't ever an option, and Saturday nights are always crazy there, and they are closed Sundays, so I haven't had many chances to do this before. But, it was a holiday Monday, they were open (and most places were not), and I could easily go before 5pm. So ... we decided to gamble, try to get there right around 5pm and get in the first seating, and yes, have sushi on a Monday. We showed up around 4:50pm, and were able to get bar seats. However, when I asked what fish was fresh, the chef said only the hamachi. And, unfortunately, it was the same chef who I have really not been impressed by. Sigh. Sushi Zone has never been a place where I'd go expecting top quality fish. It has always been good enough, but that isn't what the focus is. This is not somewhere you go to order sashimi or nigiri, even though they are on the menu. Sushi Zone is all about the rolls, and they are filled with things like mango, papaya, macadamia nuts, and lots of mayonaise. I know, I know, I'm losing all credibility here, but these things do have their place. They also make some fantastic appetizers, all prepared in a toaster oven on the side of the kitchen, by the same guy who is doing all the dish washing. We didn't know about these when we first started going to Sushi Zone, but quickly realized that every single party was always ordering them, so we quickly wizened up and discovered them ourselves. They uh, also all contain lots of mayo. Prices have also always been incredibly reasonable, although they have gone up quite a bit in the past few years. I used to be shocked at how much food we got for the price, now it seems more in line with what I'd expect. Far cheaper than most sushi places I go, but the product is also far lower quality. Service was good enough, but the timing of things was off. We received our first roll before any of our appetizers. Then one appetizer. Then the rest of our rolls. Then another appetizer. And finally the nigiri. I completely understand how this happens, as all of the appetizers are being cooked in a single toaster oven, and absolutely every party is ordering them, so they are actually the bottleneck, not the sushi chef, when the night starts out. Later on, the sushi chef gets very backed up, so even though the appetizers easily take 30+ minutes to arrive, the sushi takes much longer. Anyway, I understand how this happens, but I wished things came in a better order. Overall, our meal was ok, but nothing I'd ever wait for. Back in the day, I always left Sushi Zone so incredibly happy and satisfied, and always felt that the 3+ hours it had taken for me to get my meal were worth it. I'm sure I'll go back next time I need a mayo fix, and I'll keep trying to make it there on a night when one of the other chefs is working (if they still are? ), but Sushi Zone really has lost a lot of the magic. 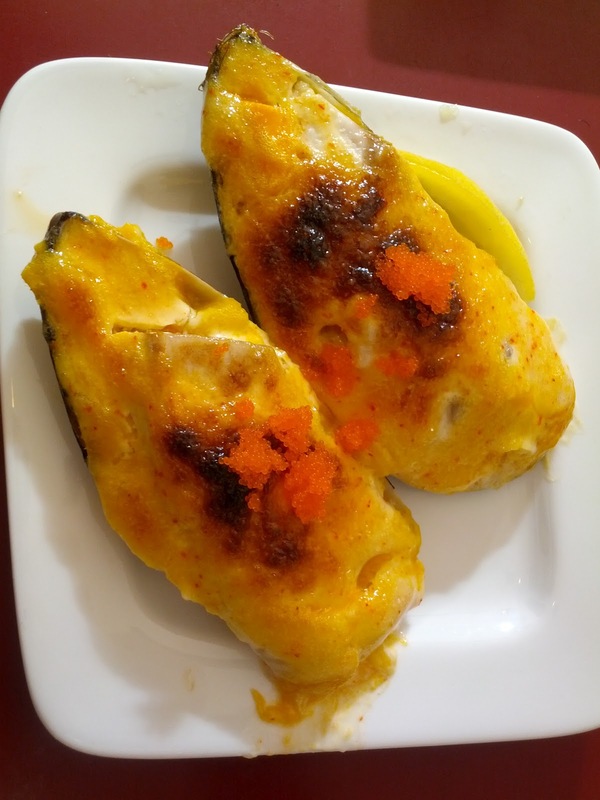 Baked bass, mango, spicy mayo, fish eggs. $6.50. This is one of the famous toaster oven appetizers. Chopped up mango, topped with a generous slice of sea bass, topped with this crazy cheesy mayo mixture, and some roe, served in a mussel shell. Always piping hot with a awesome crispy top layer. This dish has historically been one of my absolute favorites. Creamy, cheesy, sweet, delicious. Tonight's version seemed to have grown in size substantially! I guess they just fill up whatever size shells they have? Unfortunately, this did not work in their favor. The sea bass was a very generous portion, a single slice, moist, tender. This is different from how it used to be, with multiple small pieces instead. I preferred it this way and found the fish to be quite nice. The mango was ripe and flavorful, nice and warm, but mine was rather mushy and a little bit stringy. There was also just way too much of it, even given the larger than usual portion of bass, the ratio was just off, and the sweet mango just overpowered everything. The ratio was also off for the mayo/cheese sauce, there wasn't enough of it given the quantities of the other ingredients, so the creamy cheesy goodness that I love about this wasn't there. Overall this was disappointing because I know how awesome it can be, but the fish was actually better than usual. I'll still order this again next time, and hope it comes out more balanced! My favorite of the appetizers, and my third favorite dish overall. Stuffed jalapeno, spicy mayo, albacore. $6.00. And my other favorite appetizer. 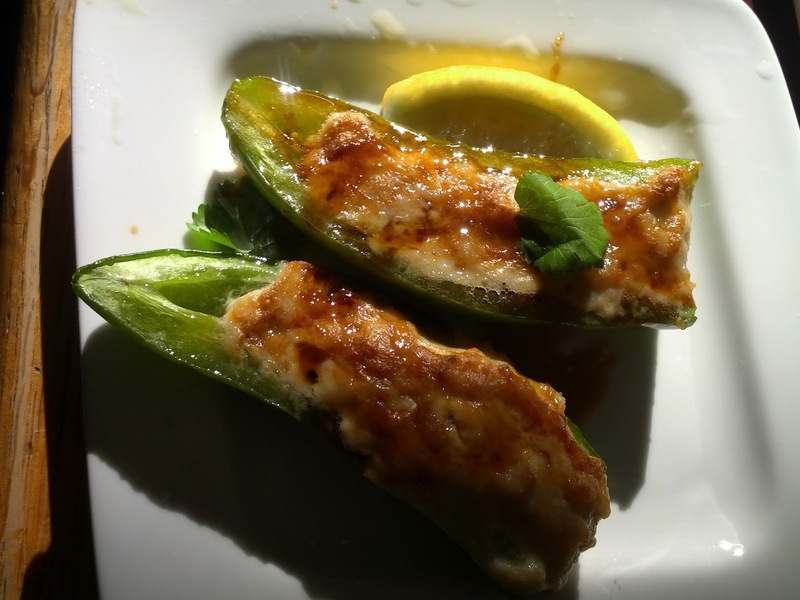 Fresh jalapeno, stuffed with albacore, and a little spicy mayo. These also seemed bigger than in the past. Again, delivered piping hot from the toaster oven. The jalapeno was just the perfect level of doneness, still slightly crispy. It had a little kick, but not too much. There was a slight amount of mayo adding some creaminess. The albacore however was fishy and overcooked, firm, and a little dried out. Least favorite of the appetizers, and second to least favorite overall. 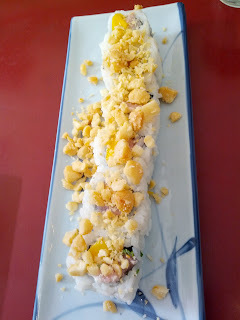 Hawaiian #2: albacore, mango, scallion, mayo, macadamia. $7.25. Ah, the Hawaiian #2. Probably their most famous roll. Usually my favorite, but always at least in my top 3. I love the flavor combinations at play here: mayo, macadamia, and mango just go together so well! Tonight though, things were off. First, the roll was poorly executed. The pieces of the roll were just too large. Perhaps hard to see in the photo, but it was impossible for me to fit a slice in my mouth. This meant that I couldn't get all of the flavors together at once, and that I had a very uncomfortable time trying to cram it into my mouth. It was also poorly rolled and was somewhat falling apart. And there was far too much rice, masking the flavors of the rest of the ingredients. This has, unfortunately, been my experience with this sushi chef the last few times. His technique just isn't there. 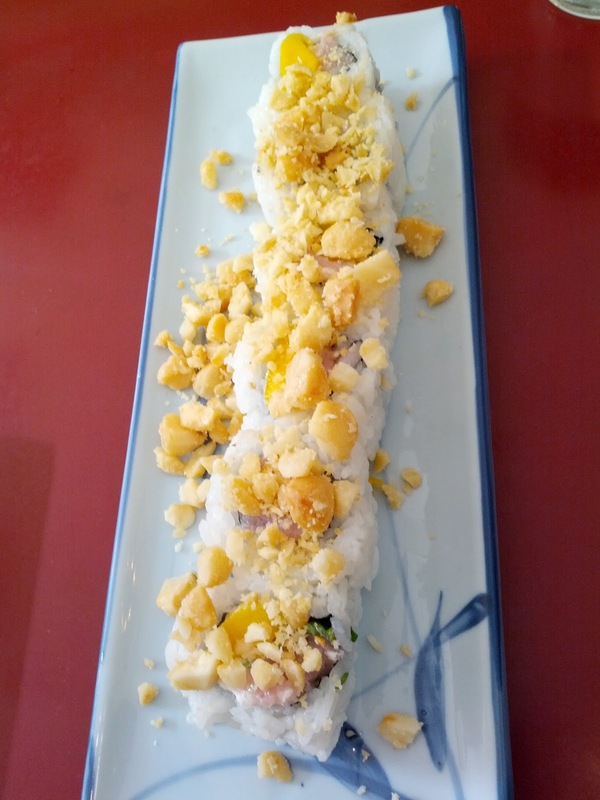 The mango was sweet and ripe enough, the mayo added a great creaminess but there was slightly too much, and the macadamias added a good crunch and paired well with everything. Again, I'll get this in the future based on my knowledge that it can be great, but we both agreed that this was the weakest dish, and wished we'd just thrown it out instead of eating it. Spicy mango salmon, scallions, sprouts, spicy mayo. $7.25. Spicy hamachi, avocado, jalapeno, lime, sprouts, scallions, spicy mayo. $7.25. 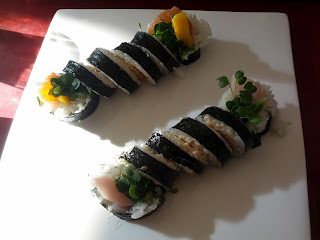 These are usually my second and third favorite rolls, either of which can bubble up to being favorites any night, just based on how good the components are. And tonight, these were both pretty good! Both rolls had a plentiful amount of sprouts and scallions, giving them a fresh feel and good crunch. They both also had same spicy mayo, that adds a really nice creaminess, but had way, way too much on them. Again, a theme with this chef, every time we had had him. The mayo overpowered everything, wiping out the flavor, which is unfortunate, because there are some great flavors in these rolls. The spicy mango salmon had generous chunks of fresh, ripe, pretty delicious mango. The salmon had a good flavor and texture, and seemed pretty fresh. Less mayo, and this would have been a really great roll. My second favorite of the night. The spicy hamachi was even better. The hamachi was fresh, firm, with good flavor. But what I love about this roll is the thin slices of jalapeno and lime. The jalapeno just adds the perfect amount of kick and the lime gives a great flavor pairing with the hamachi. Again, a little less mayo, and this would have been amazing. It was still my favorite of the night, but could have certainly been better, as it wasn't up to Sushi Zone standards! Second only to my foie obsession, has been my recent uni obsession. I'd never had the uni at Sushi Zone before. In fact, I'm not even sure I'd ever seen it on the menu. I think I'm probably usually just too busy ordering the rolls. But I saw the uni, and asked about it. I was told it was local Mendocino uni. I asked if it was fresh, and they said yes. I had to try it. There was a very, very generous amount of uni in these pieces. Hard to see in the photo, but there was very little rice in here, mostly all uni. This was a crazy portion for the price. It makes me seriously grumpy at everywhere that skimps on their uni! I didn't have the hamachi, but my dining companion said it was just ok.
Tamago is always the end to my sushi meals, my "dessert". This was a pretty forgettable tamago. It wasn't bad, but it wasn't very good either. Not much sweetness to it, which is something I'm usually looking for in my "dessert". As you are well aware by now, I've been on a foie gras kick, getting in all my last foie consumption before the rapidly approaching ban goes into effect. We were looking for a casual, week night foie-option, and I remembered that I'd recently seen some photos of an absolutely amazing sounding foie gras dessert at Fifth Floor: fried rhubarb pie with foie gras ice cream! While it sounded slightly gimmicky, it also sounded potentially amazing, and people seemed to be loving it. And I did love the foie ice cream I had there a few weeks ago. And they just switched up their hot & cold preparation. We could order all of these foie dishes a la carte in the lounge. Sold! Since I've reviewed the Fifth Floor several times now, both for lounge dining and formal group dining, I'll skip the basics here, and focus just on the individual dishes, and any differences in our experience. This time we sat at the bar (last time we were in the adjacent lounge area). There were purse hooks (seriously, it makes such a difference)! The staff were all friendly and the chef himself came out to chat several times. I really liked the vibe; it was energetic without being too loud, formal enough to include things like the amuse bouche and intermezzo but also totally casual, just really a nice atmosphere and balance of good dining and comfort. We also got to meet a couple of other foie lovers that I "know" from the web in person, as they were also dining at the bar tonight. It was fun to finally meet them! Overall, it was a good experience. I really like their lounge space and the foie gras dessert was actually mind blowing! Everything else was good, but not particularly noteworthy. Full comments on each dish below. Protip: We found out that they'll be running a special foie gras menu in June. I'm going to be out of town for a lot of the month, but hopefully we'll find a way to squeeze it in! 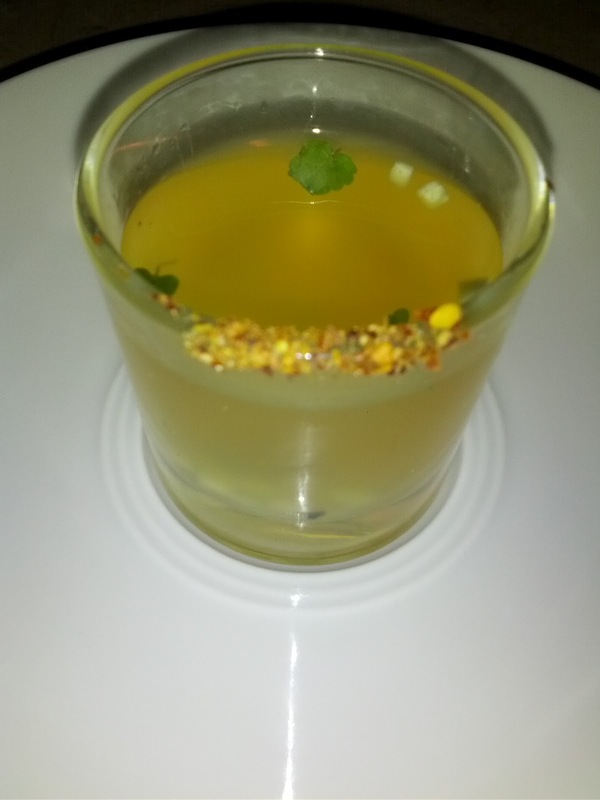 Amuse bouche: Chilled miso shooter with albacore and cucumber. I really appreciate that they include amuses even for lounge seating! They skip the bread service, which, unless bread is really phenomenal, doesn't bother me at all, I'd rather just eat more foie! Hot & cold foie gras: rhubarb, honey, cardamon milk, bee pollen. $22. 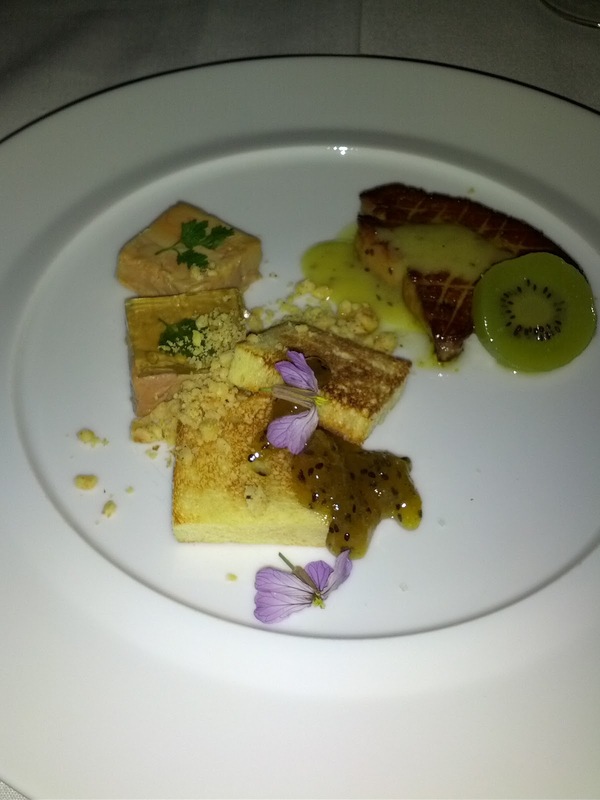 The hot and cold foie gras was my favorite dish the last time I had a formal meal at Fifth Floor. 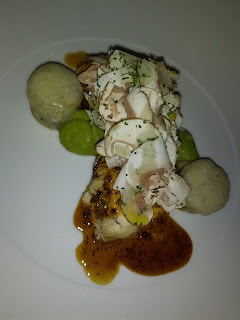 That version was more winter inspired, served with a delicious kiwi sauce, kiwi slices, toasted brioche, and hazelnuts. I was exited to see what this seasonal variation would be like! This one replaced the kiwi components with rhubarb, it came in at least five different forms. There were fresh crunchy chunks, some gel cubes, some sauce, and a layer of tiny gelee cubes on top of the terrine. These all paired well with the foie, and were nicely balanced between sweet and tart. Not quite as flavorful as the kiwi preparations however. The terrine was creamy and decent, but didn't have as strong of a flavor as I'd like. This seems to be a theme lately, perhaps I'm just unhappy with terrines and torchons in general these days, as none have seemed flavorful enough. Although, I still drool thinking back to the one from Commonwealth, by far my favorite cold preparation I've had recently. Leaning against the terrine were two honey tuiles. They were crazy sweet. Too sweet, even for sweet loving me. The hot version was a letdown. It had a decent sear and great texture and flavor, but it wasn't hot. It was barely even warm. Again, this seems to be a theme these days! I want my hot preparations of foie actually hot please! Or ... at least warm. This was also inconsistent from the rest of the service we received, where I was impressed with the fact that dishes were served at pretty much perfect temperatures, particularly the desserts. The foam was a cardamon milk, but I didn't really taste much cardamon. I would have liked to, as I imagine that pairing quite nicely with the rhubarb and foie. I paired this with a lovely glass of Sauternes, sweet and delicious as always, and it complimented the foie perfectly. One thing that surprised us about this was the serving size. Both the hot and cold preparations seemed to be only half as large as last time we had this dish, where it came with a much larger seared piece and two generous slices of the cold prep. I wouldn't say this was a bad size serving for the price, but it was noticeably smaller. Overall this was fine, but neither preparation is in the top versions I've had recently. The seared piece would have been much, much better if served hot, and I have preferred other fruit pairings (like the kiwi sauce last time!). It also would have benefitted perhaps from a small piece of bread product (like the brioche last time!). I guess I just can't but help compare it to the last version I had of this there, and which I found more successful. This was good quality foie however, and I'll certainly continue to try out any other preparations they have! The burger is only available in the lounge. Like last time, it came with a fluffy brioche bun, perfectly melted comte cheese, fresh crisp lettuce, and crunchy pickles. It had a good sear on it, and the patty was flavorful enough due to being made from a mix of ground short rib, chuck, and skirt steak. 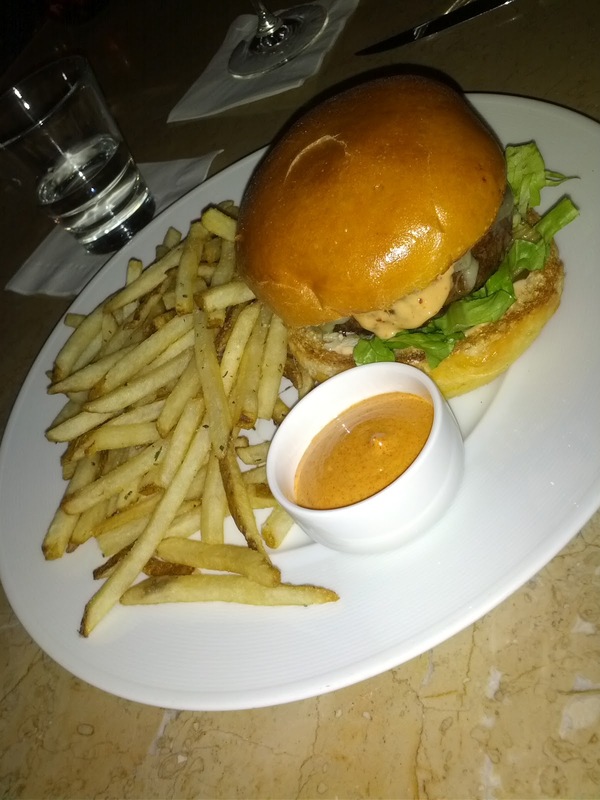 Served with skin on fries that were crisp but pretty forgettable, and a nicely smoky pimento aioli. I feel about exactly the same towards it this time as last time, where I reviewed it in a little more detail. A good burger, but I'd certainly pick the Alexander's burger and their fries any day. Crispy Tai Snapper, ahi blanco, scallion, fennel, trout roe. $16. (Photo from 1MandaBear). This was absolutely crazy! I'd heard about a technique that the chefs used to make a crispy layer out of scales, and one of my internet buddies down the bar ordered this. She very generously insisted that I try some, and I'm glad she did, as it was a totally unique preparation! As she cut into it, the crunch and crackle was audible from where I was standing a few feet away. It was really incredible. When I cut my piece, the same thing happened. Sounds are not something I normally associate with eating, but this really added to the experience. The fish was really well cooked, moist, tender. The fennel was fresh, light, refreshing. And the crispy scales really were great! I'm not sure I've really ever had scales before, but the taste was just like skin, and this level of crispiness was just unparalleled in anything I'd ever experienced. I'd gladly order this dish myself some time, and at $16 this seems like a crazy value for a generous size piece of fish! 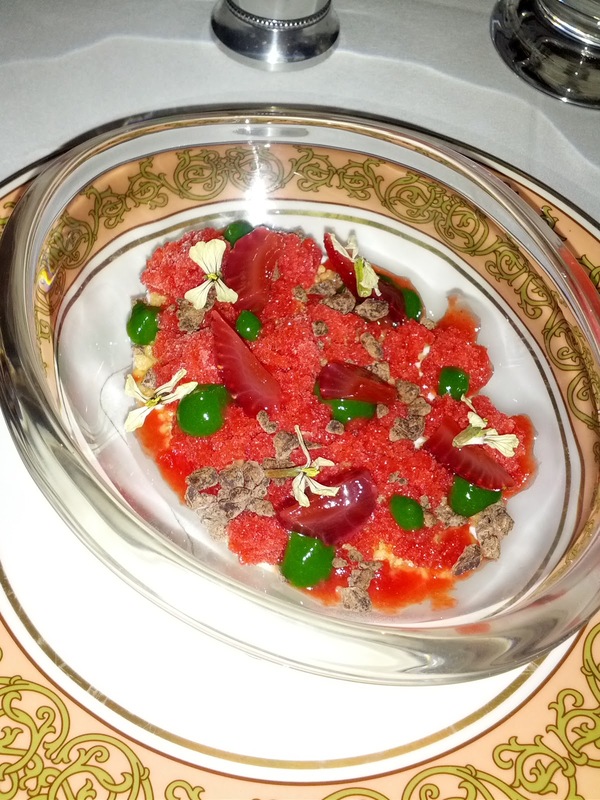 Intermezzo: vanilla bean panna cotta, strawberry sphere, candied kumquat, muscatel granita. This is one of the best intermezzos I've ever had. Every component was things I adore and they were all executed perfectly. The panna cotta had a great consistency and strong vanilla flavor. Much, much better than most panna cottas I've had lately (and yes, I've had a lot of them). The strawberry sphere was a standard molecular gastronomy sphere, it burst perfectly when bit into, and was filled with really great strawberry flavor. Like eating some very delicious strawberry jam! It paired wonderfully with the panna cotta. The candied kumquat was slightly sour, and delicious. I love candied kumquat. The muscatel granita added a fun cold component to the dish. I loved this, as did my dining companion, who rarely likes desserts. I would order this as a full size dessert in a heartbeat. I wish I could! 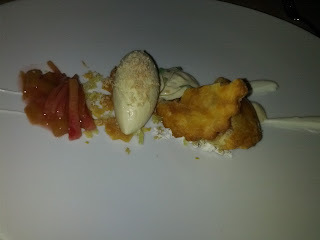 Fried rhubarb pie, foie gras ice cream, ginger, crème fraîche, pie crust foam. $12. This was the dish I was most excited about, having seen a photo of it a week earlier. While I don't love rhubarb, I do love warm pie and ice cream, more than perhaps any other desserts. Warm pie a la mode was a big thing in my house growing up! But, I'm usually disappointed by pie and ice cream at restaurants. And foie gras ice cream? While awesome sounding, it also seemed gimmicky (I'm not a stranger to foie gras ice cream, having had a disappointing version at one of Lafitte's foie dinners and a great version in an intermezzo at Fifth Floor previously). Lets just say that I went into this dish excited, but with a very healthy dose of skepticism. This dessert was downright phenomenal. I eat a LOT of desserts. At least 3 a day, usually more like 5 or 6. This is one of the best I've had in recent memory. Truly fantastic, and not just because of the foie! The fried rhubarb pie was pretty much perfect. Delivered piping hot. My biggest pet peeve with these sorts of desserts is that they rarely are warm. This was clearly fresh out of the fryer! The shell was amazingly crispy, I guess this is what happens when you fry pie instead of bake it! The crust was buttery, full of flavor, and just delicious. It put the pie crust of pretty much every other pie I've had in recent memory to shame. The rhubarb inside was warm, soft, and a good balance of sweet at tart. Also on the plate was more candied, stewed rhubarb. I don't love rhubarb, but this was pretty good, and it went very well with the ice cream. The ice cream was fantastic. Perfectly creamy, served at the exact right temperature to be solid yet soft and melty. So much better than a lot of restaurant ice cream, where I'm always disappointed by the consistency. And it did have a great foie flavor to it. Amazing on its own, or with the candied rhubarb, or, for the perfect bite, with some of the hot pie. Also on the plate was some tart crème fraîche that paired well against the rhubarb. And some pie crust espuma that unfortunately didn't taste that much like pie crust. And a walnut crumble, that looked great, but had a strange texture to it that I didn't care for. Anyway, this was an incredible dessert. Warm pie and ice cream, elevated to a whole new level. I could have eaten several of these. If I can make it back before the ban, I WILL be ordering this dessert again. I'd go back just for this dessert even. Man, I want more now!!! Even more amazingly, my dining companion also loved this. And recall, he doesn't do sweets. This was definitely a dessert, and definitely had sweetness to it, but it was so well balanced with the tartness from the rhubarb and crème fraîche, and the richness of the foie gras, that it worked for him. And it worked for me. I'm not sure this will ever happen again, with us both enjoying the same dessert! Winning dish of the evening, for both of us. Madras curry cake, strawberries, guava, white chocolate, candied fennel. $12. The wine was really intensely spiced. We had no idea what to expect for food pairings with it. We were treated to two more desserts! These were really, really interesting dishes. The pastry chef is known for working with intensely savory ingredients in his desserts. And since my dining companion actively dislikes sweets and desserts, this was the only hope he had for possibly helping me out with eating these! First, this was a sight to behold! And the ingredients were indeed incredibly unsuspected. The cake was fluffy and light, with slight curry flavor. I didn't find it particularly interesting. I eat a lot of cake/cupcakes, and this style of cake just doesn't ever really do much for me. The strawberries were pickled green strawberries, which seem to be the rage these days. We'd just seen them show up paired with our foie gras starter and in a dessert at Alexander's the day before. Vinegary and pickled, these were definitely a sour, not sweet, component. The candied fennel was delicious! Insanely crispy. Slightly sweet. Slightly anise-y. I loved these. I'd eat candied fennel chips any day. The sorbet was guava flavored, and very, very sweet. It seemed out of place given how savory all of the other components were. I thought it was too sweet, and even though I like sweets, didn't care for it. Finally, there were white chocolate pieces, filled with crispy bits. They were pretty generic. This dessert didn't do it for me, but it was interesting to see a more savory approach taken to dessert, and the plating was really lovely. I wouldn't get it again, but I'd love to just get a side of candied fennel chips! 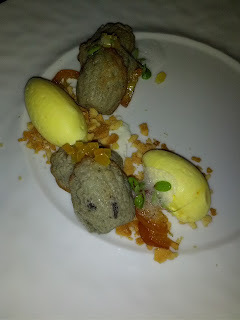 Black Olive Madeleines, saffron ice cream, candied kumquats. $12. And another savory dessert! The current dessert menu at Fifth Floor is really quite creative, offering 6 choices - a cheese course, these two savory ones, the foie ice cream and pie, a crème brûlée and then a more traditional chocolate bombe to satisfy those folks that need their chocolate. No real safe or classic choices here, as even the crème brûlée that I had last time had a crazy spin on it. The madeleines, like the pie, arrived nice and warm. Serious points for this. Warm, fresh baked goods are just so much better! They were intensely black olive tasting. There was no doubt whatsoever that you were eating black olives. Not exactly my thing, but really quite creative, and an impressive amount of flavor was infused in them. The ice cream was really good, again like the foie ice cream creamy and a nice consistency. It had a lovely saffron flavor. There was also more delicious candied kumquat, which paired nicely with the ice cream, as did the crumble. I didn't catch what it was made from, but it gave a nice crunch to eating spoonfuls of ice cream. Protip: If you want to make this at home, you can find the recipe here! I wouldn't order this one again either, but again, I was impressed with the creativity. What I disliked in this was clearly just personal preference, as the execution was spot on. 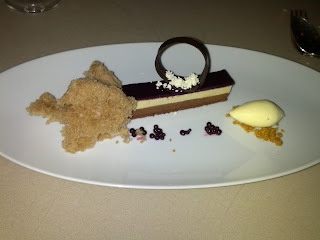 Pastry Chef Francis Ang is a really talented pastry chef, and I'm really interested to see more of his creations. He is clearly willing to experiment with all sorts of flavors, textures, techniques, etc. And, he made some killer beignets at a cooking demo I went to a few months ago!